The “Family Guy Maneuver” can be one of my favorite things to use, but it’s only effective when used sparingly. Not, you know, every five seconds. The A-Team was one of my favorite shows from my younger days, and the A-Team movie was absolutely perfect. Best movie ever. 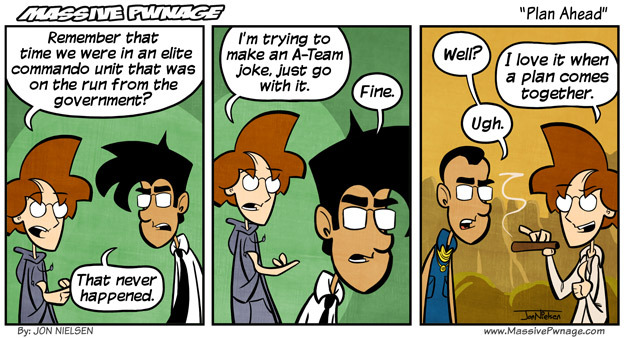 This entry was posted on Monday, June 14th, 2010 at 12:00 am and is filed under Comics. You can follow any responses to this entry through the RSS 2.0 feed. Both comments and pings are currently closed. Im sure i would understand this if i had watched A-team before. Well…we get to see Locke with a Mr. T mohawk so Im not complaining. Guys I can’t agree with ya’ll more on your post. The A-Team did a really good job of respecting the original series but bringing it up to a modernized telling. Awesome, awesome movie. Great strip as always. Are they trying to shoot down that drone? No, they’re trying to fly that tank.